Your Local Kowhai 'Roof Coating' Guy. ​Services we offer: Roof restoration and re-coating only. from Cape Reinga to Wellsford. I have a professional roof restoration team that is dedicated to providing a high level of quality service and airless spray application. Hi I’m Kevin Murray your local `Kowhai Guy’ for the North Shore. Together with my wife Jane, we’ve operated our own area for Kowhai since 2004. Our area covers from the Harbour Bridge to Mahurangi. Thankfully we don’t need to cross the bridge! We have a small friendly crew of experienced guys specialising in roof refurbishment. ​Services we offer: Roof restoration and re-coating, general maintenance, leak call outs and re-roofing. Hi I'm Glen Galloway and I have been involved in the Auckland roofing scene for more years than I care to remember.We have recently taken on Kowhai roof restoration as part of our roofing services and are proud to have a quality experienced team to serve our area. Unlike many, we represent a true one stop shop for all your roofing needs and will ensure you get the best service available. ​Services offered: Roof restoration and re-coating, general roof repairs. Hi, I’m Martin Culpan and my Kowhai Roofing area is West Auckland. I’m your local Kowhai Guy and here is a little bit of background information to introduce myself. I have gained a wealth of experience in the roof restoration field I am really enjoying the challenge, and with the support of the Kowhai nationwide network, I also enjoy the advantage of delivering superior proven roof coating systems and top quality paints specially formulated for New Zealand conditions. Services offered: Roof restoration and re-coating, general maintenance, leak call outs and re-roofing. ​Hi, I’m Ian (Jnr.) I’m your local Kowhai Guy for South Auckland, servicing from Puhinui Road South. I am supported by the Kowhai national network to ensure that you get the longest possible life out of your roof it is essential to keep its weatherproof coating in great condition. Damaged or worn roof coatings can result in leaks and degradation by moss and lichen growth. This in turn can lead to much larger roof repair or roof replacement costs in the future. We have roof coating solutions for all roof types including steel, concrete tiles and pressed metal tiles and all of our roof coating work is covered by a 10-year warranty. Services offered: Roof restoration and re-coating only. Hi, I’m Gavin Bond, your local Kowhai Guy. I have been living on the Coromandel for over fifteen years and grew up in Matamata. After a visit to the Coromandel as a child, I knew this was the place for me. I take real pride in my work and in being your local Kowhai guy. I believe in providing a top quality job for a fair price and I look forward to being of service to you. Services offered: Roof restoration and re-coating, general maintenance/repairs, and leak call outs. Hi, I am Nick Hill your Kowhai Guy for Hamilton and surrounding areas. I have recently joined Kowhai after restoring roofs for about a decade under my own business. I pride myself in my workmanship - which is a key reason Kowhai wanted to team up with me. For myself, I was after access to the best products and roof coating systems, so in Hamilton this is a perfect marriage! I will guarantee to give you professional and qualified advice on how to sort your roof. 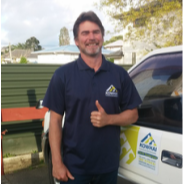 ​Hi - I’m Carl, your local Kowhai Roofing representative, I have 15 years of both on the tools and sales experience in the roofing field and am privileged to look after the Kowhai Waikato area consisting of Tokoroa, Putaruru, Matamata, Cambridge, Morrinsville & Surrounds. Having started and run my own successful roofing business for a number of years it was when we were looking at options to better our position in the market we had the chance to come on board with Kowhai. With my experience and Kowhai’s systems and suppliers we are able to help with most of your roof maintenance needs in the South Waikato & Waipa areas. For the quickest response please fill out the quotation request form on the website home page. Services offered: Roof restoration and re-coating, general maintenance, leak call outs. Hi, I’m Steve Bickerton a Bay of Plenty man through and through. I suppose everyone has a claim to some kind of fame and mine is from a long history in the roofing restoration business. I am your `Kowhai Guy’ for the Bay of Plenty and you can rely on my roof services for moss & mould removal treatment, waterblast cleaning, roof painting and restoration/repairs including putting an end to those hard to find leaks. Services offered: Roof restoration and re-coating, general maintenance. Kowhai is now in the Rotorua/Taupo area! We are really pleased to be able to announce Ash and Yaneen Miller as the Kowhai Guys for this area. Ash is currently supplying edge protection in the Waikato and has a couple of other business interests, but is very focused on supplying re-coat services to the two areas that Kowhai has not been able to service for the last 2-3 years. Sorry, we do not have a "Kowhai Guy" servicing this area but are seeking suitable applicants . ​Learn more about joining the network. Hi, I’m Matt Wiig, your local Kowhai Guy for the sunny Hawkes Bay. Services offered: Roof restoration and re-coating, roof repairs and re-roofing. Hi, we are Tony and Sharon from the Naki. We have been building and restoring homes around NZ for more years than we care to count and are now Kowhai's newest Kowhai Guys. We are caring for roofs throughout the Naki and when we say care - we mean it. You will be hard pressed to find the same level of care and commitment to roof restoration anywhere else in Taranaki. No where in the Naki is beyond our reach - so dont be shy! Hi, My name is Malcolm Skinner. I was born in Wellington and came to Wanganui in the early 90’s after having started work in 1988. I began a plumbing apprenticeship in 1992 and became registered in 1998. I took on the Kowhai franchise in in 2001 and found that it complimented my plumbing skills immensely. Services offered: Roof restoration and re-coating. Introducing a new Kowhai Guy for the Manawatu! Our extremely successful Kapiti Kowhai Guy has expanded into the North Island Heartland - utilising local expertise of course! We now offer an expanded roof restoration service to the Manawatu, backed by years of experience gained here and overseas. ​Services offered: Roof restoration and re-coating, general maintenance, leak call outs and re-roofing. Hi, I’m Gwil Hughes, I’m your local Kowhai Guy for Wellington - covering Churton Park up to Otaki and everywhere in between. I started my roofing career 18 years ago in the UK working on large commercial properties, some over 10 storey's high - I had to find my roof legs very quickly at that height! Having used several other paint products I feel privileged to be able to use the superior Kowhai paint system - I can assure you first hand it is the best on the market. Hi, we are Frank and Mana Hogan of Wellington City. We are local lads that have 10 years of roof coating experience. 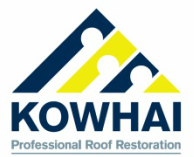 We have recently joined the Kowhai team, to combine our passion for customer service and quality roof restorations, with the backup and support of the nationwide network of Kowhai. We can service your roof for leaks, repairs, maintenance, re-coating and even complete re-roofs. Outstanding quality materials, NZ’s best roof coating system, and now us!.....Kowhai has it all in Wellington! Hi, my name is Tim Nicholls and I am your local Kowhai Guy for Nelson/Tasman area. I have been involved in the roofing industry, beginning with school holiday work producing Monier Roof tiles ​at the Christchurch factory. After building my roofing business up in the Nelson area, I realised that it was time to bring my painting skills back into service. The best way to do this was to get involved with a name you can trust - Kowhai. Sorry, we do not have "Kowhai Guys" servicing this region. We will be seeking suitable applicants . Hi, I’m Vinny Chaw, your Kowhai Guy for the Canterbury region. I am a Canterbury man born and raised. I have lived here all my life and through every earthquake. I’ve been involved in the roofing and building industry from new roofs to re-roofs, roof restorations and re-coating, gutter protection, new guttering, house painting, just about anything and everything. Hi, I’m Kieran Fahy and I have recently joined Kowhai to look after the southern part of Christchurch through to Ashburton and the surrounds. A professional painter inside and out (literally! ), I have decided to seriously branch into roof restoration, having done many roofs in past years. Who better to team up with than Kowhai, as I get access to superior roof coating systems and fantatsic technical support. All this means that Helen and myself are available to Southern Cantabs to do a thoroughly professional roof restoration at your place. We are Kowhai's newest Kowhai Guys and proud to service Ashburton to Oamaru. We are backed by Ranger Specialist Coatings - a local South Canterbury coating specialist for many years. With their professional expertise and Kowhai's products and systems, South Canterbury is well served for your roofing restoration needs. Services offered: Roof restoration and re-coating, general roof repairs and leak call outs. ​Hi there, My name is Scott Campbell (Scotty) and I am your local “Kowhai Guy” in the Dunedin and Otago region. Thanks for the opportunity to meet you. I had the pleasure of being introduced to Kowhai and was offered work with a company that has the same morals and customer relations standards as myself. Because of their reputation, I gladly accepted the opportunity to get on board and to utilise our combined skills, to help people increase the value of their biggest investment. Hello I’m Graeme Howie, co owner of Kowhai Southland/Lakes with my wife Deb. We are proud to be your ‘Kowhai Guys’ for the Southland - Lakes region. It was with great excitement that we were offered the franchise with Kowhai and the opportunity to tie our existing painting business(mainly interior), with one of New Zealand’s leading roof resurfacing companies with quality proven products and top service.